One of your top mind parisian brands has launched a new event store to host its latest collection. Designed by Fabrizio Casiraghi and art direction by Humberto Leon and Carol Lim, this 120 square meters store is a must to visit in Le Marais. Mustard velvet curtains, colored neon lams, minimal tigers and an incredible ornate tapestry designed by Olivier Colombard, which symbolizes the new era of both art and design director of the maison: Humber Leon and Carol Lim. If you want to visit its colorful walls and touch this incredible velvet note down this space into your list. There is something at Avenue Montaigne that will catch your eye. Balenciaga has opened its last store in Paris, the forth in the city and the second one since Gvasalia took over as creative director. Industrial aesthetic, slaughterhouse look and feel and minimalistic stainless steel furniture. Key pieces of the store are: industrial conveyor rails for clothes, aluminum foil ceilings and changing rooms of cast concrete. We are more familiar with this style, but minimalism and marble always are a winner choice. Drapeu Noir, a french menswear brands opened its first store in Paris. Where in Paris? Le Marais of course. Metal lacquered in black with a white and grey marble surface. Cast concrete floor and some cactus around. Easy peasy? Not really, find the balance between color and create a simple store could be more difficult that what it seems. There is a narrow line that can lead to shabby. Etienne Renard, a parisian artist, put the finishing touch with hand drew logo at the door and some gold leaves around it. A 70 square meter store full of pink, gold and minimal furniture. Nourah Al Faisal, the designer of this unique jewelry brand seems to have a pretty clear opinion of she wants regarding colors and spaces. 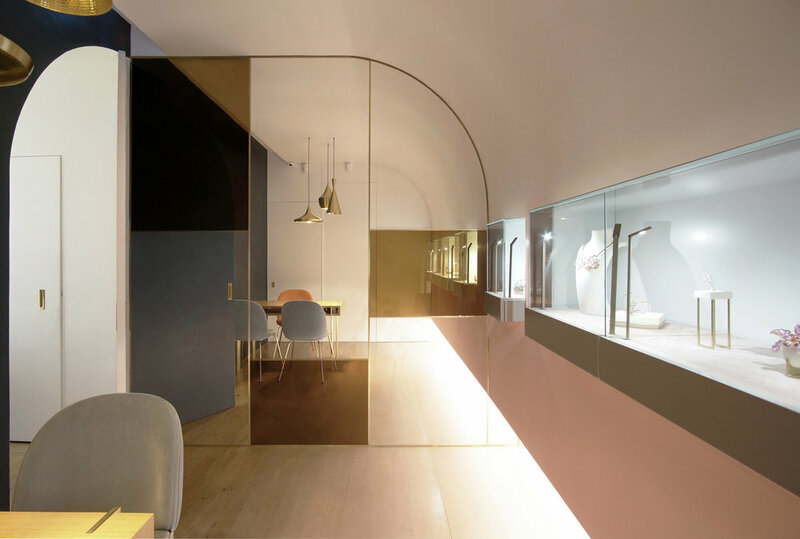 Colored walls, all along the store, a small corner called "the boudoir", which creates a shadow effect with a gradient from white to light pink. Also parquet floors, gold frames and brass fittings everywhere..